The Black Rock Desert is an arid region in the northern Nevada section of the Great Basin with a lakebed that is a dry remnant of Pleistocene Lake Lahontan. The region is notable for its paleogeologic features, as an area of 19th-century Emigrant Trails to California, and as a venue for rocketry and land speed records. It is also the location Burning Man is held at annually. There are several possible definitions of the extent of the Black Rock Desert. Often people refer just to the playa surface. Sometimes terrain which can be seen from the playa is included. The widest definition of the Black Rock Desert region is the watershed of the basin that drains into the playa. Humboldt, Pershing and Washoe Counties of Nevada intersect at the Black Rock Desert. 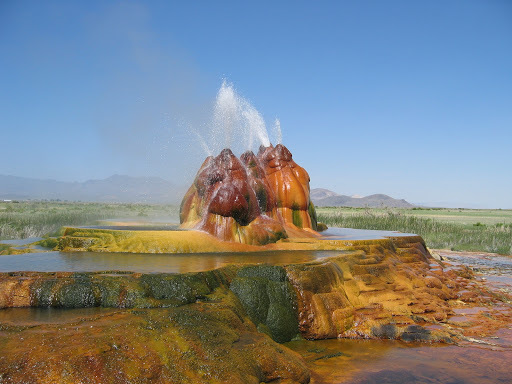 The desert has numerous volcanic and geothermal features of the northwest Nevada volcanic region, including two Black Rock Points at the southern end of the Black Rock Range and which have dark Permian volcanic rocks similar to another Permian black diabase dike formation in Nevada.